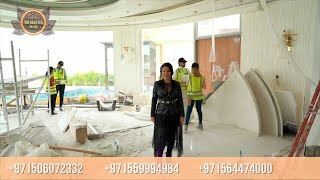 Office renovation and fit-out Dubai is the most difficult and responsible type of finishing works, because the interior of the office, its appearance, is one of the most effective tools for forming a general idea of the company as a whole and the overall working atmosphere within the team. The original design, new finishing materials and non-standard layouts have become mandatory for office interior fit-out from Luxury Antonovich Design. Creating a project and its implementation is a process in which our designers and the best masters of several specialties take part. — get quality guarantees for the whole complex of renovation and fit-out works. — selection of lighting and furniture — soft sofa sets of nice gray color, soft armchairs and coffee table. Our maintenance crews from Luxury Antonovich Design are working under the control of an experienced foreman with many years of experience. The office project is supervised by our chief engineer and chief designer with experience in the commissioning of large facilities in the commercial sector. Each of these materials requires work on a specific technology. Painting, styling and other fit-out works require thoroughness, experience and professional tools that you can find in our company. The successful use of these materials and their combination depends on the sense of taste and skill of our expert designers of Luxury Antonovich Design.